Students with difficulty finishing their studies have a chance now to continue pursuing their dreams after Senate passed a bill that will guarantee a full tuition subsidy for students in state universities and colleges (SUCs). The Senate Bill 1304 or the Free Higher Education for All Act seeks to institutionalize a tuition-free policy in the country's 112 SUCs was passed on Senate last March 13 with 18 affirmative votes. It is sponsored by Senator Paolo Benigno Aquino IV who said, that the passage of Affordable Higher Education for All Act is a clear message from the Senate to every Filipino that they prioritize education, that they choose to invest, first and foremost, in students, children in the next generation. Under the bill, CHED is being mandated to manage and administer an SUC Tuition Subsidy Fund that will be made available to SUCs that will comply with requirements set by the law. Who is qualified for the full tuition subsidy? Filipino students currently enrolled or will enroll in SUCs can get the full tuition subsidy upon meeting the admission requirements of the state university or college. For students "with the financial capacity to pay for their education in the SUC," the Senate bill mandates the state university or college to create a mechanism that will enable these students to "opt out of the tuition subsidy or to make a donation to the school." The bill also specified which students are not eligible to avail the subsidy: those who already attained a bachelor's degree or any equivalent degree in any HEI, and those who have been "dishonorably discharged from any HEI… for any reason other than financial difficulty in paying tuition and other fees." Currently, the Senate is waiting for the version of House of Representative of the said bill. 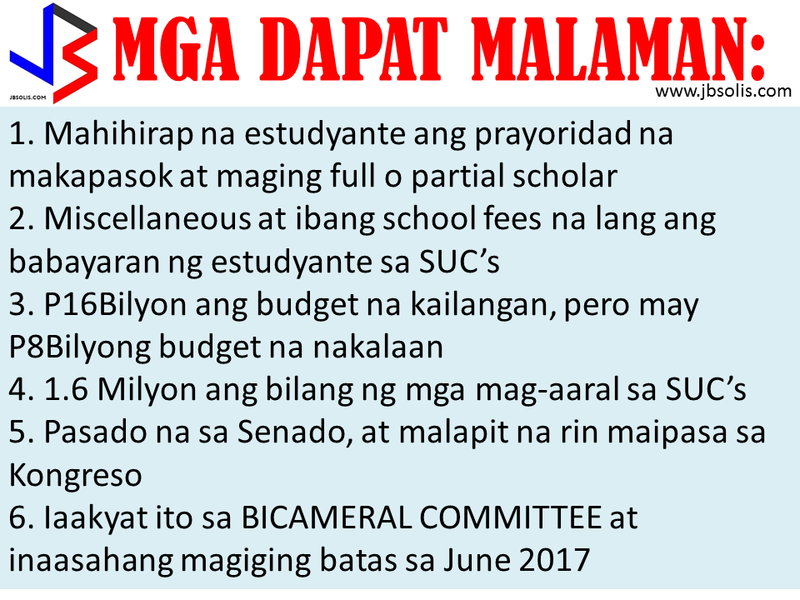 There are several bills filed at the Congress regarding tuition-free policies in SUCs as of the moment. In 2017 national budget, P8.3 billion is allocated to provide free tuition fees in SUCs. 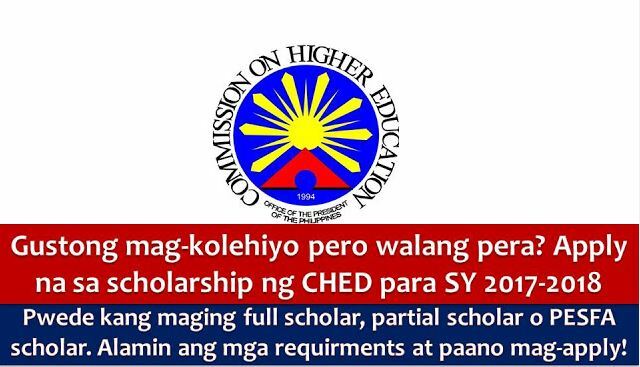 Want's to pursue college but lacking financial resources, the Commission on Higher Education (CHED) is now accepting applications for scholarships under State Scholarship Program for the coming academic year 2017-2018.Under the Scholarship Program, applicants may be qualified as a full scholar, partial scholar, or PESFA scholar. One of the many challenges of parents and students is the very high cost of post-secondary or college education. 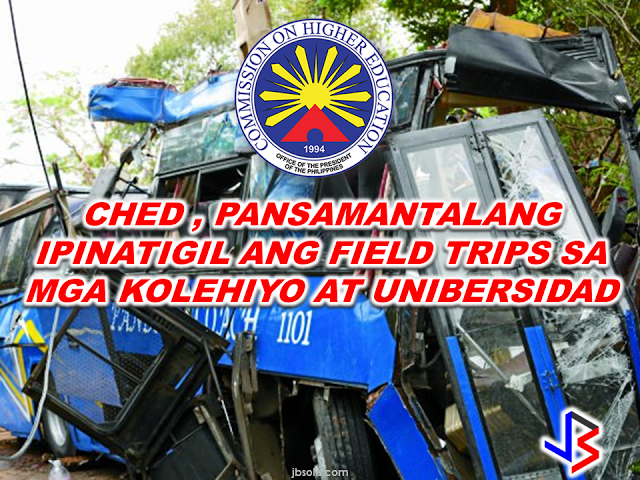 In 2015, according to the Executive Director of CHED, Atty. Julito Vitriolo, the participation rate of students who enter college is only 26%. And in order to help the many students who cannot afford college education, the Commission on Higher Education is offering a loan where students could have the chance to study and pay later, about two years after finding an employment.